Click on an icon above to get started. What is Jesuit Volunteer EnCorps? Those in this transitional “encore” stage of life often ask themselves, “What now?” They may wonder about their next steps, how they can live out their faith more deeply and continue to make a difference in the world. Many also long for a kindred community with whom to share the transformative journey. JV EnCorps can help to support the fulfillment of these longings. JV EnCorps is a proud member of the Encore Network. The Encore Network is a resource for leaders and organizations in the encore movement, which taps the skills and experience of those in midlife and beyond to improve our communities and the world. For more information on the Network, member organizations, and their activities, visit the Encore Network website. JV EnCorps has programs in Portland and Bend, OR; and Seattle, Spokane, Tacoma, and Vancouver, WA. See below for contact information specific to each location. Click on a question below for answers to frequently asked questions about JV EnCorps. What are the program's core values? What kind of volunteering do JV EnCorps members do? JV EnCorps members (JVEs) commit to ten months of part-time volunteer work. JVEs provide valuable direct service to partner agencies working with people who are economically poor or marginalized. They volunteer in non-profits that address social, educational and ecological issues that prevent people from living fulfilling lives and impact the quality of community life. Others volunteer with agencies working for systemic change against unjust structures. assisting non-profits promoting fair wages, raising concerns for the environment, educating people about ecological and social injustices, etc. JVEs lend their skills and talents to crucial community needs, while opening themselves to new works, new skills, and new insights. Members find that volunteering allows them to use their wisdom and skills earned over a lifetime to make a difference and engender a sense of purpose. 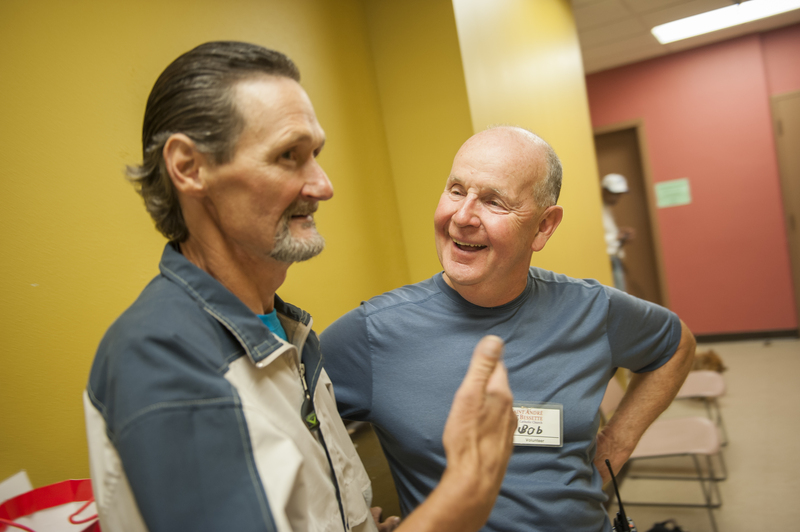 The volunteer service also provides an energizing source of hope, support, and community. Most JVEs agree that their lives are enriched by both the volunteer work and the ongoing sharing and interaction with the JVE community. How are service sites determined? Members can choose to continue their existing volunteer commitment that fits with JV EnCorps service goals of serving those who are economically poor or marginalized or addressing social, educational and ecological issues, as long as that position meets the minimum volunteer time commitment. JV EnCorps staff can also work with those who need placements to find a match based on the JVE’s interests, skills and goals. JVC Northwest has been placing talented, committed volunteers in the community since 1956 and has developed an extensive network of partner agencies. JV EnCorps will draw on those relationships to find opportunities that fit with the JVE’s interests while providing impactful and meaningful service experiences. Do I have to be Catholic or follow a particular faith practice or tradition? JV EnCorps is grounded in the Catholic Ignatian tradition, developed by St. Ignatius of Loyola, founder of the Society of Jesus (the Jesuits). We also value and welcome those whose spiritual journey is influenced by other traditions and practices. We believe that richness in community comes from the sharing of diverse spiritual beliefs and practices. The communal and spiritual aspects of the program are what set it apart from other volunteer opportunities. Transformation occurs for JVEs when they serve others and take time to reflect and share with each other about their service experiences. JV EnCorps members are invited to reflect on the meaning and purpose of their lives through the lens of JVC Northwest’s core values: community, simple living, social and ecological justice, and spirituality. The program draws on the wisdom and expertise of local Jesuits, as well as lay people well-versed in spiritual formation and practice. JV EnCorps supports and encourages a life of intentional service and contemplation, inviting participants to a deeper awareness of and connection to God in everyday life. Who was St. Ignatius and why does he matter? St. Ignatius of Loyola, founder of the Society of Jesus—the Jesuits, was a 16th Century Basque soldier who experienced a profound conversion and transformation after being wounded by a cannon ball. During his recuperation he began to focus on the movement of spirit and how paying attention to consolation and desolation can help people discern their best choices. He believed that looking at our actions and contemplating them prayerfully could lead to changing our behaviors and, ultimately, to transformation. He developed a spirituality, a way of proceeding, that included ongoing reflection through such tools as the Examen, imaginative prayer and other exercises to help people become contemplatives in action. Ignatian Spirituality, as it is now known, has been used widely by people of many faith traditions to help them listen to God’s deepest desiring for them and for the world. What does community mean for JV EnCorps? Supporting each other in our efforts to live out the guiding Core Values of JVC Northwest: community, simple living, spirituality, and social & ecological justice. JVEs are asked to commit to a one-time or monthly good-will monetary contribution according to their financial ability to help defray costs of the retreats, meetings and other expenses. In addition, JVEs are expected to pay the costs of transportation to and from their volunteer commitments, community meetings and retreats as well as the cost of spiritual direction. Jesuit Volunteer EnCorps members (JVEs) commit to ten months of service and monthly meetings and retreats with other JVEs. They are guided in this work by JVC Northwest’s four values: community, simple living, social & environmental justice, and spirituality. Ten months of part-time volunteer service (5 – 10 hours weekly) with a non-profit organization beginning in September and ending in June. Schedules vary, depending on the needs of the agency and the volunteer, and many JVEs choose to work in more than one agency or continue their volunteer work through the summer months. Monthly JVE community meetings, plus two retreats during the year. Commitment to personal spiritual growth and development through reading, reflection, prayer, meditation, journaling or other regular spiritual practice. Regular meetings with a spiritual director or guide are also encouraged. JVEs are welcome to continue in the program for more than one year. JVEs work for social and ecological justice, alongside those who are marginalized in our society, including people who experience poverty, hunger, disabilities, and abuse. They provide direct services and serve as advocates for more systemic change. JVEs often choose to work in an organization that can utilize their skills and experience, or they may decide to explore and develop new skills, perhaps in projects unrelated to previous job experience. Some JVEs volunteer at community sites where they have already volunteered for some time, or sites that they have found recently, and which fit our mission as described above. Others volunteer in new settings which JVC Northwest staff members have helped them identify. A community of peers: JVEs are fifty or older, bringing a rich variety of experiences, perspectives, and curiosity to the wider community and to one another. They are a spiritually focused group invested in one another’s growth and success, with a shared commitment to the transformative impact of Jesuit Volunteer EnCorps. 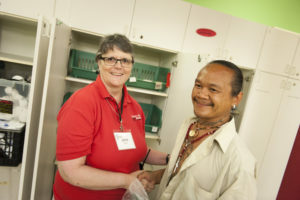 Dynamic community partnerships: JVC Northwest has served the people and lands of the Pacific Northwest since 1956 in partnership with local organizations familiar with community needs. JVEs have an opportunity to make profound, lasting contributions where needs are great. They can apply their professional and personal skills and talents to the work of a service site, while meeting new populations, learning new skills, gaining new insights, and growing in wisdom and effectiveness. Greater awareness of God’s presence and action in their lives: Jesuit Volunteer Corps Northwest was founded in the spirit and tradition of the Society of Jesus (the Jesuits). The founder of the Jesuits is St. Ignatius of Loyola, whose spirituality – or way of living out his faith in God – invites us to become more deeply aware of our experiences in everyday life, discovering the Divine in all things. JV EnCorps is grounded in this Catholic, Ignatian tradition. Like JVC Northwest’s Jesuit Volunteer program, JV EnCorps values and is welcoming to those whose spiritual journey is influenced by other traditions and practices. We believe that richness in community comes from the sharing of diverse spiritual beliefs and practices. Participants in JV EnCorps are invited to reflect on the meaning and purpose of their lives through the core values of community, simple living, social & environmental justice, and spirituality. Making a difference: JV EnCorps members embrace both the challenges and the gratification of working with people who are marginalized by society. They draw hope from working with others to solve difficult social and ecological problems. Witnessing injustice transforms the JVEs, inspiring them to live in solidarity with the people and places they serve. JVEs can apply their professional skills and talents to the work of a service site, while simultaneously trying new work, learning new skills and opening themselves to other perspectives. They witness the transformation of individuals and communities, assisting people to become actively aware of the societal and environmental injustices that exist in their lives, neighborhoods, and country. Thank you for your interest in applying to become a JV EnCorps member! The application deadline for the program year beginning in September is August 31, but applications will still be considered if received past the deadline date, depending on the current size of the JV EnCorps group. Prefer to mail a printed application? Click here to download. Then print, complete, and mail to the address printed on the application. If you need us to mail or email you an application, contact us at JVEnCorps@jvcnorthwest.org or call 503-335-8202. The program begins in September with an orientation retreat and completes in June with a closing retreat. Applications for the upcoming service-year will be available and accepted beginning in mid-January and are due by August 31. Applications received after the due date are still considered depending on the current size of the JVE group. Following interviews and acceptance into the program, agency site placements will be arranged throughout the summer so that JVEs can begin their service work in early September, following Labor Day. Some JVEs enter the program already engaged in a specific site placement in which case they may be volunteering throughout the summer months. Support the Jesuit Volunteers and those they serve with a contribution to JVC Northwest. Thank you! JV EnCorps now in 6 Cities! This Portland-based program is also now in Seattle, Tacoma, Spokane, and Vancouver, Wash., and Bend, Ore.! 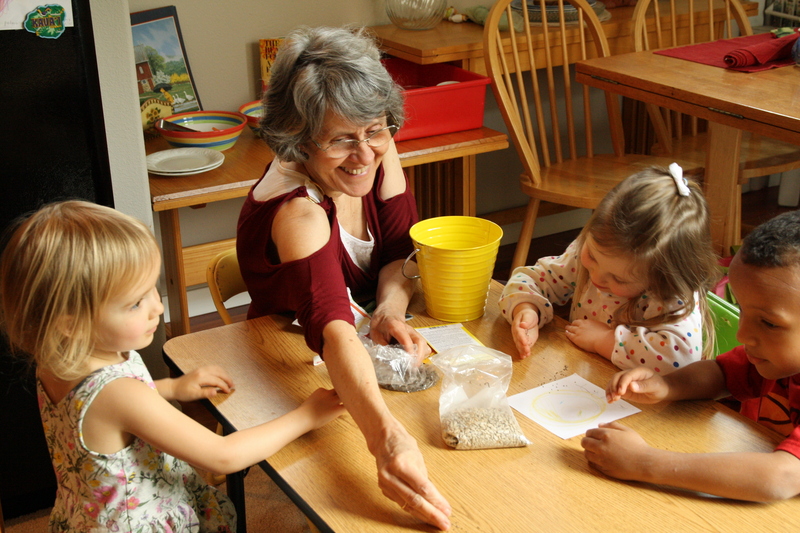 JV EnCorps supports adults ages 50 and older who serve part-time, meet in community, deepen their spirituality, and explore values of simple living and social & ecological justice.